The DeLorean from Back to the Future in 1:25 scale! Snap-fit kit means no glue or paint required for assembly. Features authentic looking brushed metal look! Polar Lights brings back another popular movie car, the Time Machine made famous in Back to the Future! 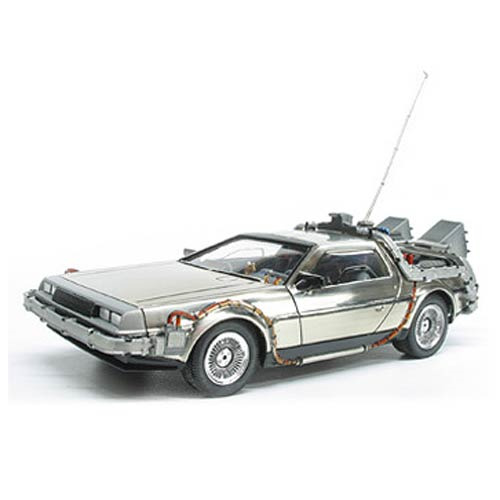 The Back to the Future DeLorean Time Machine 1:25 Scale Snap-Fit Model Kit features every detail to be expected in a Polar Lights kit from the flux capacitor to its Mr. Fusion power plant. A lightning rod hook power assembly is also included as an option. The car body features an authentic looking brushed metal look that captures the brushed aluminum of the real car and is unique to this kit. The tires roll and the snap assembly means the kit can be assembled in no time with great results; no glue or paint required! Skill level 1. Recommended for ages 8 and up.